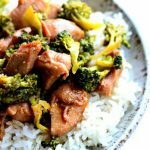 Slow Cooker Pork and Broccoli–you’ve heard of Asian beef and broccoli but I’m mixing it up today by using pork sirloin instead. This gluten free crockpot recipe is super easy but it will make you feel like you’re eating at your favorite Chinese restaurant. 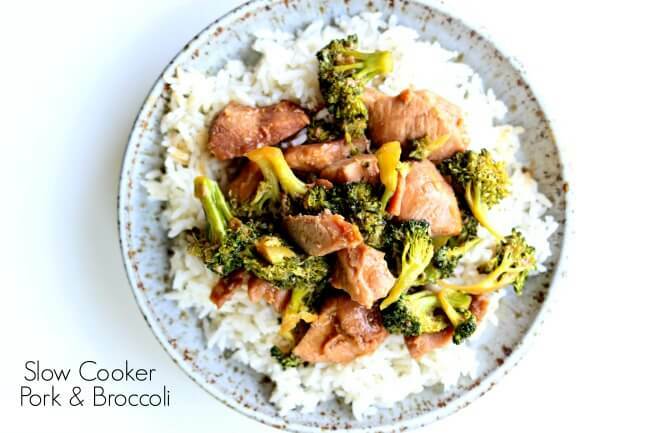 Tender pieces of pork and a super savory sauce with semi-cooked broccoli all go together nicely over white rice. We have a new Winco in our neighborhood! I’m super excited. If you haven’t heard of Winco before it’s a really great grocery store that has super awesome prices. And they have a bulk bin section that is to die for. I just bought chocolate chips for $2 a pound. I am so very pleased about that as I’m always on a quest to find the best chocolate chips at the best price. Anyway…I went to Winco on the opening week and they had pork sirloin for $1.00 a pound (and chicken breasts too…more on that in a coming recipe). Pork sirloin is usually fairly inexpensive (I find it for around $2.00 a pound) and I have used it in several of my crockpot recipes before (I’ve listed those recipes below). 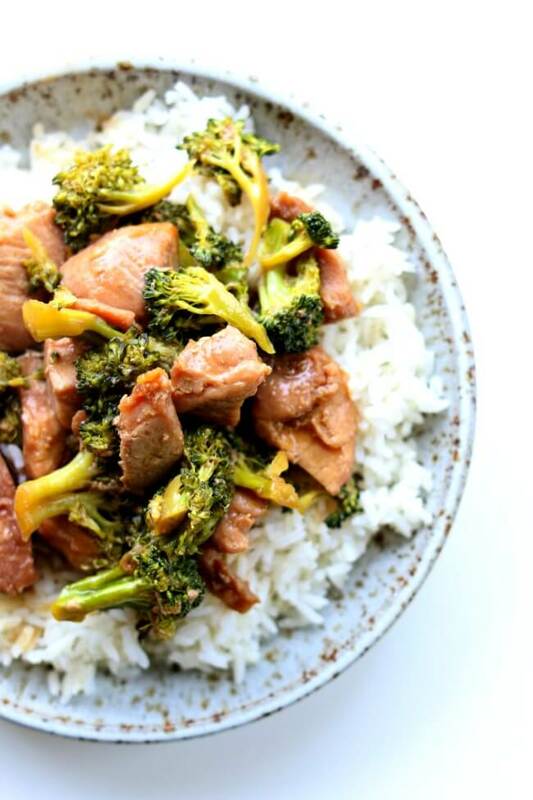 So today I decided to cook the pork in a savory Asian sauce until it was tender and then I added in fresh broccoli (frozen broccoli works great too). It turned out very tasty and it took literally like 10 minutes to get it into the slow cooker. 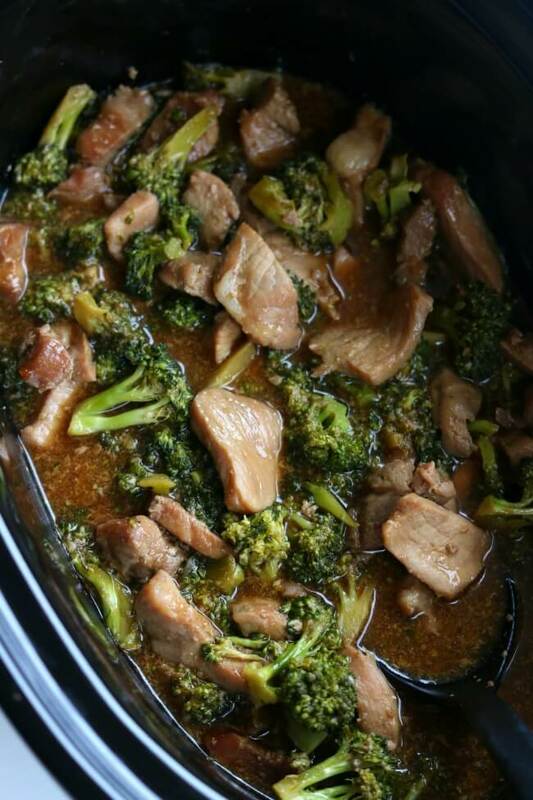 For this slow cooker pork and broccoli I used Tamari which is sort of like a low sodium gluten free soy sauce. I like Tamari for the flavor but it doesn’t overpower the dish with too much saltiness or MSG-ness. Pork sirloin is an economical option for dinner this week! Try these other great pork slow cooker recipes. Skinny slow cooker pork carnitas: lean pork cooked in your slow cooker with onion, garlic, jalapeno, and lots of spices. Then the pork is crisped up on the stove top in a little olive oil creating maximum flavor for tacos, salads, burritos, nachos and enchiladas. Skinny Crockpot Barbecue Pulled Pork: Love pulled pork but don’t want all the fat? Try this easy recipe for skinny slow cooker BBQ pulled pork and serve it on top of buns, in a salad or as a pizza topping! Slow Cooker Pork Gyros with Tzatziki Sauce: Well seasoned meat on top of a soft pita and creamy flavorful tzatziki sauce…a perfect dinner for any night of the week. 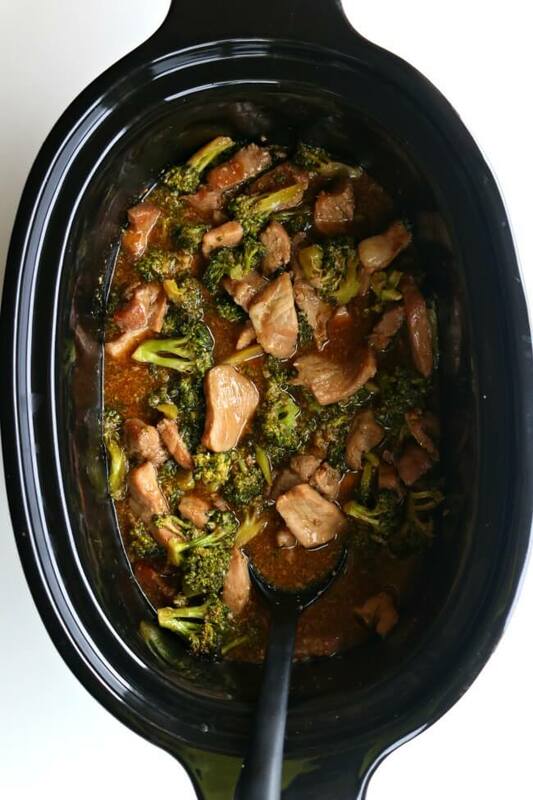 For this slow cooker pork and broccoli recipe I used my 6 quart oval Kitchenaid slow cooker. I love this slow cooker (you can see me talking about it in a video here). It cooks low and evenly. I love the medium heat choice because most slow cookers that I’ve seen only have the option of cooking on low or high. If you’re going to buy just one slow cooker, this is the one that I recommend. 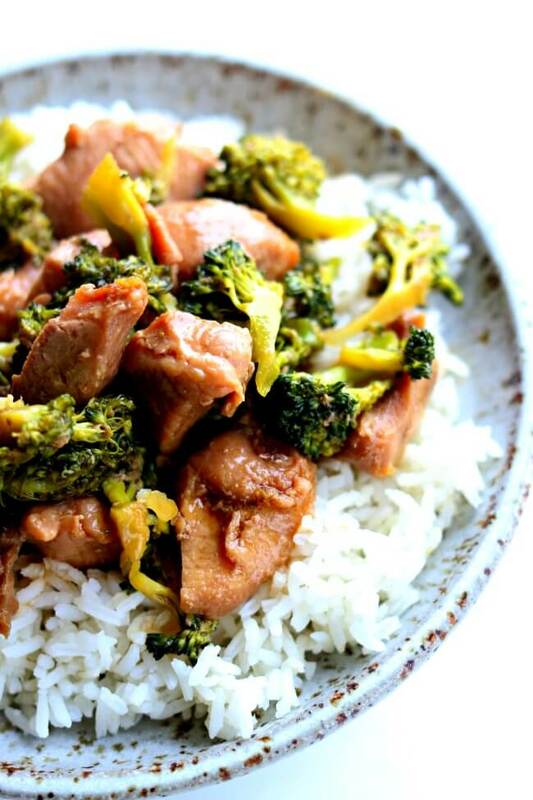 Tender pieces of pork and a super savory sauce with semi-cooked broccoli all go together nicely over white rice. In a 4-6 quart slow cooker add the beef broth, tamari, oyster sauce, brown sugar, sesame oil and garlic cloves. Whisk until smooth. Add in the pork and stir to coat with the sauce. Cover and cook on low for 3-4 hours. Remove the lid and turn to high. Make a cornstarch slurry by mixing the cornstarch and water in a small bowl. Add the slurry to the slow cooker and stir in well. Add in the broccoli* and stir in. Cover the slow cooker and cook on HIGH for about 30 minutes, until the broccoli is cooked through and the sauce is thickened by the cornstarch. *I used fresh broccoli but I chose to steam it in the microwave for a couple of minutes before adding it to the slow cooker. I just prefer the taste and texture of broccoli that way. If you use frozen you may want to run hot water over it in a colander before adding it to the slow cooker. That way it won’t bring the temperature of the food in the crockpot down too much. This recipe looks delicious. I plan to double this recipe tonight. I assume I would double all the ingredients. Would i double the cook time too or add an extra hour or so? Double the ingredients and keep the time similar. Maybe add an extra 30 minutes or so. I used steamed frozen broccoli, nuked kit for 2 minutes then added for the last 45 minutes. Came out fantastic!. My wife said we could have this every week. Broccoli is good for you, but I usually don’t care for it. Bathed in the sauce it’s great. Next time I will add mushrooms. With just a few ingredients, it’s very flavorful. The butcher at the store cut the meat, to 2 lbs. Have a hard time finding the oyster sauce, it’s by the soysouce.